This is an update to my post I did a few years ago on how to make a script that will automatically keep you connected to VPN. 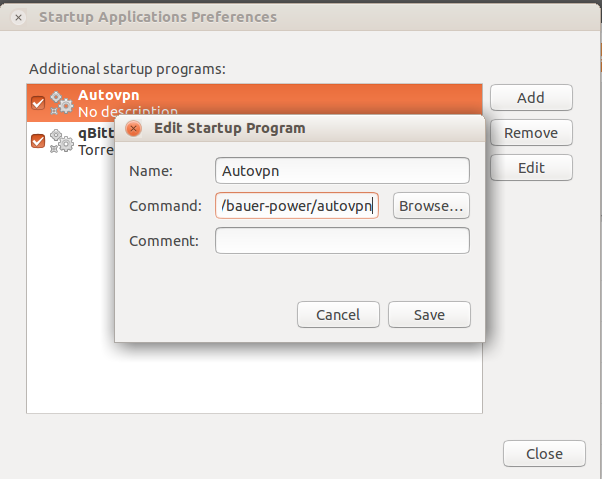 You would think that it would still work in Ubuntu 15.04, but then you would be wrong. For some reason Ubuntu 15.04 doesn't like people adding random scripts to init.d anymore. You get errors about lsb tags and overrides. Since we are no longer using /etc/init.d you don't need to add your password to the VPN file in /etc/NetworkManager/system-connections/. You also don't have to change the password flags. Network-manager-pptp package has a bug in it where it doesn't like to connect to PPTP VPN connections and errors out. Ok, so for the first item, I got around the /etc/init.d issue by creating my autovpn script and placing it in my home directory. I then went into Applications > System Tools > Preferences > Startup Applications and added my script in there. When I reboot and login, the script is launched in the background and keeps me connected to VPN! echo "Disconnected, trying to reconnect..."
The only difference from my original script is changing status to show. You can read the original post on how to find the UUID of your VPN connection. After I saved that file I rebooted and VPN connected fine. May 6 20:33:14 Media-Server NetworkManager: <warn> error disconnecting VPN: Could not process the request because no VPN connection was active. It took me a while to sort this out, and it wasn't very fun. Hopefully it will help you! If it does, let us know in the comments. Damn! Got my first copyright notice. Time for extra precautions.